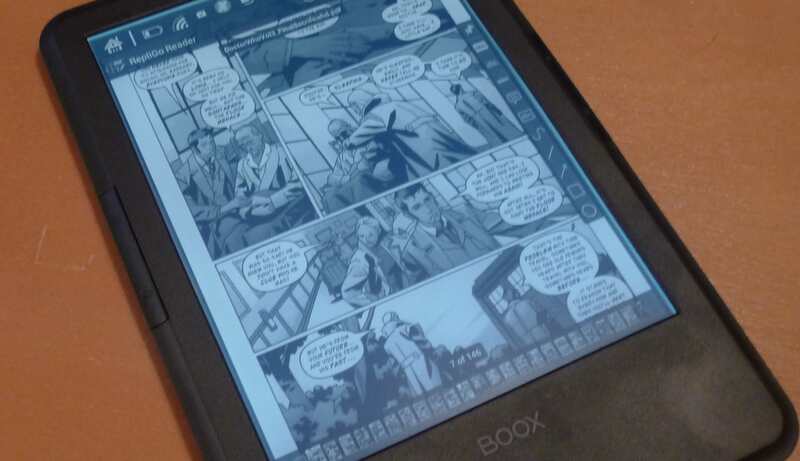 Onyx has rolled out a new update for their larger ereader, the T68 Lynx, the week before last. There's been no formal announcement of the update, but a fellow Android ereader devotee tipped me to the news. The T68 Lynx sports a 6.8" Pearl E-ink screen and runs Android 4.0 on a 1GHz CPU. It was originally released in June and has been updated a couple times since then. The new update can be installed from the T68; it can be found in the about menu under the settings menu. I've installed the update and after testing it I would strongly urge you not to touch it. The update adds a number of features (as well as a fix for the touchscreen) but not all of the changes are improvements. Also, I have encountered a serious problem. Google Play is no longer accessible. Every time I try to open it, it either closes right away or freezes and then closes. According to the changelog, the update is supposed to add a way to manage your Google account (there was no option for this before), and I suspect that something was inadvertently broken instead. This issue is particularly troubling because I just put my T68 Lynx through a factory reset. I don't have any apps at all, and now I can't install them. I am currently waiting on ArtaTech, one of Onyx's partners, to tell me how to fix this. When it comes to the rest of the update, it's a mixed bag of useful improvements and changes that hurt more than they help. The official changelog is at the end of the post, and while I can't say that I tested all of it both my source and I noted several changes. My source reports that his touchscreen now performs better; I never experienced the issues reported by some so I can't comment. The update adds several apps, including a sketchpad app called Onyx Scribbler and Drive and News apps from Midiapolis. The update is also supposed to have added improved TTS, but since a recent factory update has deleted the Ivona folder I have no way to test it. There's also supposed to be a better option for Google accounts, but I (still) can't find anything which looks remotely like what I would expect on Android. But never mind the annoyances; after playing around with the T68 I have discovered that Onyx has also updated OReader, the stock reading app. I can't tell you whether the changes were made in this update or an earlier update which I missed, but I have noticed that the design of the app has changed - and not for the better. But on the plus side, OReader is now considerably faster than it was when I reviewed the T68 Lynx in June. it now turns the page nearly as fast as the Paperwhite or the Aura HD. In June it was much slower. I'm also seeing different options for fonts and other settings. For example, there is a slider bar for bold which I'm pretty sure wasn't there before. There's a similar slider bar for adjusting the contrast, but I can't see that it is having any effect. All in all, I am really disappointed in this update. It adds almost nothing which benefits me, while at the same time it ruined the reading app. That last isn't such a big deal, given that I can install 3rd-party reading apps, but it's frustrating nonetheless. Is Facebook a Life Raft for Web Publishers or the New Gatekeeper? I had the same issue with Google Play. Another factory reset (sigh) fixed it. I am wondering if maybe the factory reset is what really borked your T68. No problems with updating existing apps or installing a new one. So the changes to OReader really are new? Thanks for the confirmation; I wasn’t sure. As for the borked Google Play, the earlier update might have been the cause but a reset is not supposed to break things like that. Where do you see the Google accounts page, exactly? The only page I can see is a generic page which lets me configure an Exchange email account, a generic email account, or the two new apps that came with the update. Please let me know where you see the Google accounts page. I might be able to use that to fix the Google Play issue. heh – I agree that a reset should not break things, but since it clearly zapped your Ivona folder, I figured who knows what else might have been broken. 4. There is a ‘ADD ACCOUNT’ command on the right, and a listing of already-configured accounts below. 5. Tapping the ‘ADD ACCOUNT’ displays a list of available account types to create, including Google. 6. Tapping ‘Google’ walks you through adding either an existing or new account. I’ve got that menu but I’m not seeing any option for Google. Okay, I am truly borked. Nope, it’s not the factory reset that botched Google Playstore. It’s the Google Playstore bug after the update that forced Nate and I (and many other users) to factory reset our T68 Boox Lynx. I had to do it twice as well, as the first time didn’t change anything for me. Thanks for warning me Nate, I was quite frustated when the first reset didn’t change the broken Playstore ! Actually, I did two resets before the update. The first was so I could lend the T68, and the second was after it came back from the loan borked by the first reset. Then I updated, discovered it was still borked, and reset again. I suppose you can install an alternative launcher. I know you can on the Nook. It might not offer access to features like a light-slider though. After a recent update to my m96 from ArtaTech, Google Play stopped working as well. However, a factory reset fixed that. Maybe you could try doing another reset on your Lynx. As for the full screen mode in Oreader … well it is there somewhere. I know I assigned a double tap in the top area of the screen to toggle it and it hides the system bar. Before doing that you also need to configure how the full screen mode should look like. I already tried a factory reset after the update, as suggested by ArtaTech. I still don’t have Google Play. My working theory is that this is another part of the software which was borked. At the suggestion of ArtaTech, I have reset my T68 for yet another time. Now it works. Why and how factory reset fixed what it broke, I can’t tell you. We are investigating your problem, but factory reset should work. It’s not “Mediapolist” it is Midiapolis. Like Midiapolis.com.